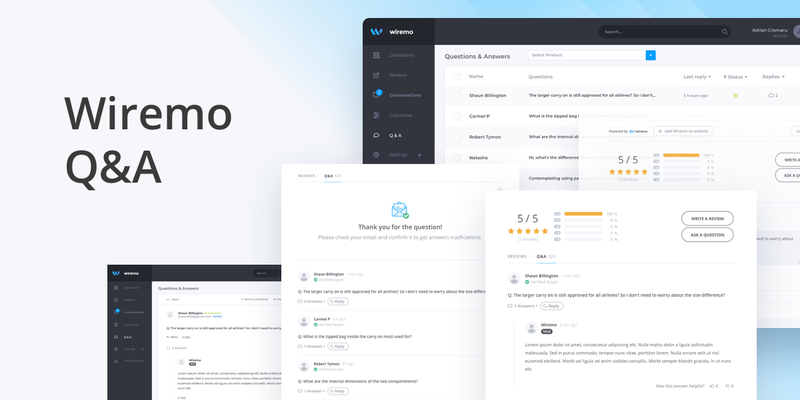 We are proud, and it's our great pleasure to announce the official launch of a new and great feature - Questions and Answers (Q&A) for our customer reviews widget. In this post, we will show you how to set it up and get the maximum out of it. Enable Q&A - it's clear that this option enables or disables displaying Q&A in Wiremo widget. Collapse Q&A answers - this option provides the possibility to collapse the answers. In case a user finds an interesting question, the answers can be uncollapsed. Below, in this tutorial, we will show you how it works. Anyone can answer - when enabled, anyone including you can answer questions. In case it's disabled, only admins can give the answers. 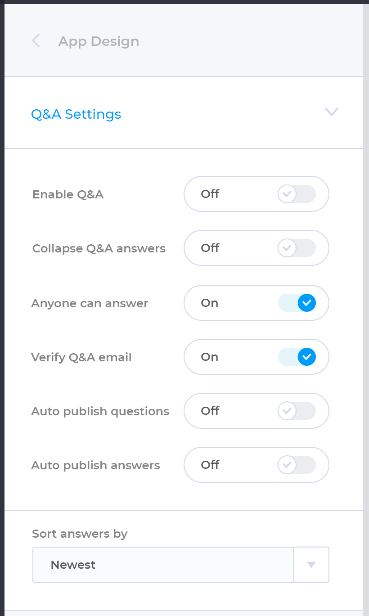 Verify Q&A email - this option provides the possibility to check the users' email so the person can get a notification when an answer is provided. Auto publish questions - this option provides the possibility to auto-publish all the new questions. You can moderate the questions later. Auto publish answers - this option provides the possibility to auto-publish all the new answers. You can moderate the answers later. Sort answers by - you can choose how to sort the answer for the questions in the widget. You sort the answers by newest or oldest. Check-box - classic option that provides the possibility to act on one, multiple or all questions. Name - this column shows the first and last name of the person who wrote the question. Questions - a short preview of the questions' text. Last reply - using this column you can sort questions by the answer time. 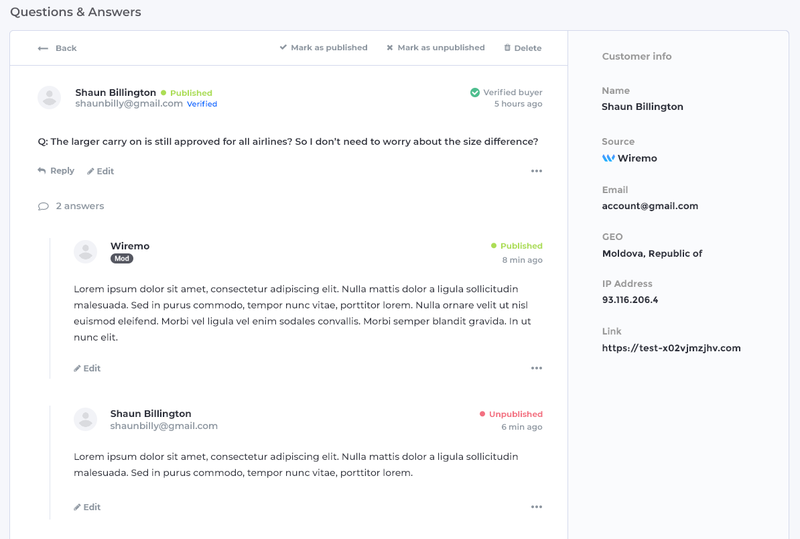 Status - this column gives you the possibility to sort question by its status: Published or Unpublished. Replies - in this column you can see how many replies a question has. All - a classic option to manage a specific or all questions. 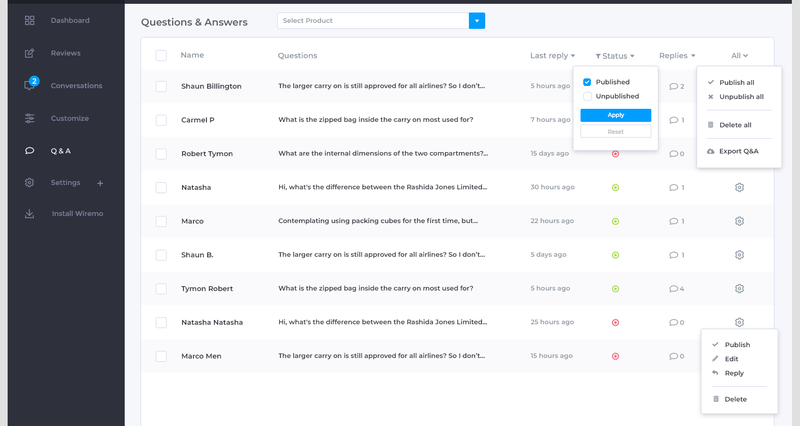 You can: Publish, Edit, Reply or Delete a question. Also, for "All" questions options, you can "Export Q&A". When you open a question, you'll find that a question inside looks the same as reviews, but with some specific differences. As you can see from the screenshot below, we've placed detailed info about the asker and the question: Name, email, question status, source, IP address and so on. In case there are any spelling mistakes, you can easily correct them by pressing on the "Edit" link. To leave an answer simply click on the "Reply" link. The same applies to questions; the answer also can be edited. You can change the question status by pressing on the "Mark as published" or "Mark as unpublished". Now the most interesting part - Q&A in the widget. Once the Q&A is enabled, all the main elements of the widget will stay untouched. The only difference is that below the "WRITE A REVIEW" button, the "ASK A QUESTION" button will appear, and an additional "Q&A" tab with the number of questions. The questions have a similar design to the reviews. The main information about the asker and how long ago the question was published. The answers can be collapsed or uncollapsed. You, as admin can reply in the widget.